You’ve probably heard the saying, “We’ve never done it that way before.” Here’s the thing: if we keep on doing the same things that we’ve been doing but expect different results, that’s just not going to happen. You have to do things differently to get different results. Make sense? Next generation multi-Asian churches are loosely defined as: autonomous English-speaking churches that are intentionally or incidentally reaching next generation Asian Americans and other non-Asians too and led by an Asian American pastor. Let me unpack this densely-worded definition. “Multi-Asian” is a portmanteau, that is, a mashup of two words: multi-ethnic and Asian American. When I talk with pastors that lead these next generation multi-Asian churches, I found that a vast majority of these churches do not self-identify as Asian American churches, even though many of their congregations consist of over 80% Asian Americans. And to be fair, none of them would identify as being a multi-Asian church either. There are reasons for this non-identification: the church may have a vision to just be a church without drawing any attention to its demographics. This thinking often comes from a theological premise that the Gospel of Jesus Christ is for all peoples (citing Bible passages Galatians 3:28 or Revelation 7:9) and the church should be welcoming of all peoples. Other churches will explicitly identify as being a multi-ethnic church, in order to express its intentionality to work at being diverse ethnically, racially, and for some, even socio-economically. For those that like more context, allow me to share my thinking behind how the “multi-Asian” term came about. If you don’t need this background information, you have my blessings to skip the next 2 paragraphs. There are other terms that could have been used instead of “multi-Asian.” In sociological circles, other terms are used to describe this demographic, like pan-Asian, Asian-American, Asian Pacific Americans (APA), or Asian American and Native Hawaiian Pacific Islanders (NHPI). This does adequately describe the multiple Asian ethnic groups coming together in an English-speaking church, and in fact, “pan-Asian churches” is a term that is currently used by some scholars and experts. But I found these terms lacking because I wanted a term that would be inclusive of the non-Asians that were part of these churches and I also wanted to acknowledge the aspirational of these pastors towards becoming multi-ethnic churches. “Third culture” is a term used for Asian Americans with bicultural background. The term originated from “third culture kid” (TCK) that was first coined by researchers John and Ruth Useem in the 1950s, who used it to describe the children of American citizens working and living abroad. “Third culture kid” refers to children who were raised in a culture outside of their parents’ culture for a significant part of their development years. The experience of being a TCK is unique in that these individuals are moving between cultures before fully developing their personal and cultural identity. While “third culture” describes well the fluidity of a multi-cultural, multi-ethnic, and multi-racial context that multi-Asian churches cultivate, I was looking for a term that would acknowledge the Asian American contribution of these multi-ethnic churches. Commonly used terms like “third culture” and “multi-ethnic” does not capture the importance of Asian Americans in these kinds of churches. So, I coined the term “multi-Asian” for lack of a better term. And in my conversation with pastors of multi-Asian churches, they seem to accept this descriptive term much better than “Asian American.” These new kind of churches are a new thing that need to be called out and a new term is only fitting. 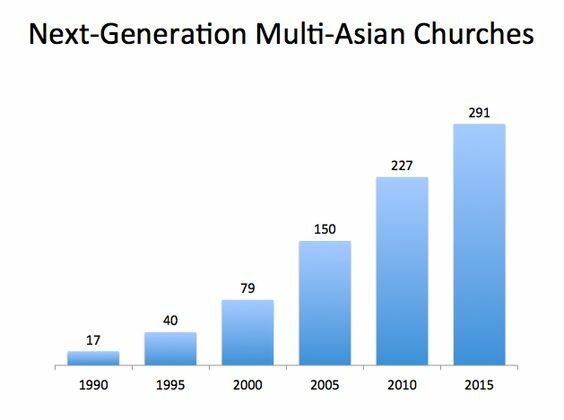 And, finally, the last word in the phrase “next generation multi-Asian churches” is the word churches. This is intended to note the autonomy and independence of these churches that are led and governed from an ethnic Asian church. When a church has its own governance, with its own finances and its own constitution, it bears all of its own responsibilities and begins to shape its own distinct identity. It should be noted that not all church plants by Asian Americans are next generation multi-Asian churches. There are also a growing number of Asian-language churches being planted to reach first generation Asian immigrants. In my own informal research, the estimated number of Asian American churches has grown 10% from 7,123 in 2007 to 7,854 in 2016. From a 2014 report, 1,787 Asian congregations are in the Southern Baptist Convention, up 54.3% from 1998 to 2013. Being only fluent in English and not a professional researcher, my knowledge of ethnic Asian churches that are reaching Asian American immigrants is considerably limited. Perhaps there are some helpful resources in Asian languages that provide more research, but I’m unable to access those. I confess that I don’t have the energy to exert more effort to learn one or more Asian languages and maybe becoming somewhat proficient. So I’ve taken what skills, proficiencies, and interests I have and use them to the best of my abilities. Some of you may be wondering why I would be interested in next generation multi-Asian churches when I’m not an academic researcher nor working in vocational ministry. Consider this as a nod (or bow) to sensitivities for my Asian heritage and its high-context cultures. If you’re eager to read about the characteristics of next-generation multi-Asian churches, you can move on to the next chapter, with my sincere blessings. A second realization was that all callings are God’s calling. God calls people to all kinds of professions and vocations. Becoming a pastor or a missionary is not a higher or better calling, though it can be considered a special calling. The best calling is the one that God created you for and calls you to. In the sovereignty of God, my years of training for and working as a pastor has been important and valuable in a different way. My work in ministry is to come alongside of churches and pastors to connect them to resources from my networking, research, and ideas. And since leaving the pastorate in 2000, this has born fruit in the Kingdom and given me much joy. My first job after pastoring was working part-time at a family foundation. L2 Foundation is a private family foundation founded by Paul and Alice Chou, that has a mission to develop the leadership and legacy of Asian Americans for Kingdom impact. The Chou’s had been blessed by the generosity of God and wanted to be a blessing to others. For the next 10 years, I was a part of facilitating opportunities and gathering resources to catalyze next generation Asian American leaders for making Kingdom impact. Highlights include these 2 books published by L2 Foundation: Asian American Youth Ministry and Conversations: Asian American Evangelical Theologies in Formation. From 2006 to 2009, I worked as a program director through a partnership formed between L2 Foundation and Leadership Network. Leadership Network had a mission to work with innovative church leaders to multiply Kingdom impact. And I got to be a part of developing what that would look like in an Asian American context. In other words, I was on point to identify the innovations among Asian American churches. I also started compiling a list of Asian American church plants. I worked with the assumption that what we have in common as Asian American churches, amidst all of its diversity with cultures, languages, and generations, is Jesus Christ, the Bible, and the English language, albeit to varying degrees. Through that joint partnership, we hosted a handful of gatherings with next generation Asian American pastors to connect leaders to leaders with one another. One of the principles behind these gatherings is found in Proverbs 27:17: “Iron sharpens iron, and one man sharpens another.” We brought these pastors together to sharpen one another through a process that facilitates results-based conversations. And, the list of Asian American church plants continued to grow in numbers, perhaps even exponentially, time will tell. Initially, I had maintained the list through a wiki platform called Wetpaint. By 2012, with over 200 churches, I migrated the list into a spreadsheet to better manage this growing list. With that move, I coined the phrase “Next Generation Multi-Asian Churches” to describe this growing phenomena. In the following chapters, we’ll take a closer look at the characteristics, traits, and other learnings to be gleaned, including real-life stories of what these next generation multi-Asian church look like. I like the term Next Generation Multi-Asian Church to better describe the uniqueness and distinction of the churches you are talking about and agree the other existing terms don’t quite capture it all. “If you’re eager to read about the characteristics of next-generation multi-Asian churches, you can move on to the next chapter, with my sincere blessings.” > consider a clearer transition to your story in the paragraph ending with this sentence, currently it seems to switch on a dime and is a bit jarring as a reader. What is the definition of a MultiAsian.Church?